Run time: 280 minutes, over 12 episodes. 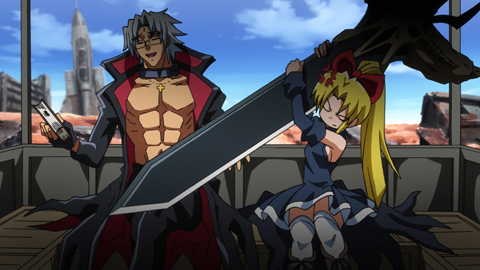 So here we are with the second and final part of Needless, a series which set out to break down the walls of convential anime with it’s first half and doesn’t show any sign of slowing down with it’s second. Or does it? We left off at an unusually slow spot in Needless with the battle in the giant bedroom in the previous collection. While that was somewhat of a drag and went probably 2 episodes longer than needed, the plot is finally moving forward again this collection. While last collection’s first half was spent introducing the cast, world and general tone, it’s second half really let it down by falling into the trap of overly long unimportant fan service battles which really were the series lowest point. Being the lowest point, that means things only get better right? Wrong. It doesn’t get better. It spends another hellish period of time in the very same location that the first collection ended, simply squandering time and showing off some fan-service. What else can I say besides that this is a pacing nightmare. Half of the entire series is spent in the same god-damn room, with next to nothing happening in said room story-wise. It is without a doubt one of the most disappointing decisions I have seen in an anime series in a long time. It’s almost as if the creators had no idea how to adapt the manga into the alotted amount of episodes and just said “screw this!” and decided to spend about 10 episodes in the same room and then after realising they actually had to end this show, rushed out any plot they could in the last 4 or so episodes. All of the plot at the end really should have been spread across far more episodes to have been effective. Besides that there is really no excuse what so ever for the horrible pacing of story-telling here. It is simply unexcusable. And with that long exasperated sigh which was what shall forever be known as “The Room of Hell” Needless loses all it had going for it at the very beginning. It could not even reclaim it with its final episodes. 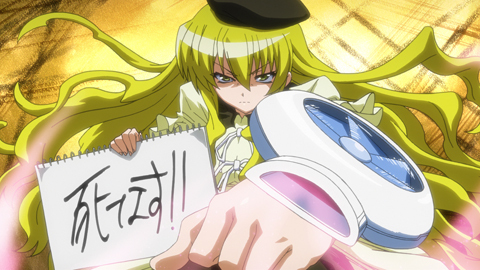 All in all, Needless will be remembered as a perfect example of were story-telling can go wrong in anime. Somewhere along the way Needless just lost control, and not the good loss of control that was in the series beginnings, the bad one. The characters completely fall flat losing nearly all the heart they had at the series outlook and are now reduced to walking stereotypes instead of being parodies (good ones) like they once were. There is little to no character development here, besides a few back stories here and there. But it is honestly just so utterly disappointing to see the characters I once enjoyed now reduced to monotonous one dimensional jokes. I just can’t wrap my head around how things could turn so bad for this show. Especially when taking in to account how much promise it showed in the early goings. The very little character action going on here is so very small or poorly done that in the long run feels irrelevent or just plain disappointing. Thankfully the art and animation is still in good shape even when the plot and characters have spun out into a complete chaotic mess. 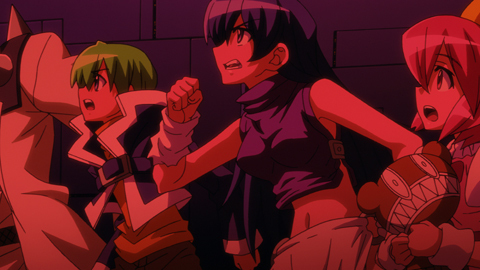 The art stays in its comfortable spot somewhere close by Gurren Lagann’s artstyle. While it doesn’t stray too far, there is some pretty dodgy animation sequences, however when their are sakuga (fluid animation) scenes, the series really does look brilliant, even if what is actually happening is far from it. All in the all the artwork is perhaps the crowning achievement of Needless, however that isn’t too hard to achieve when you take into account how bad most of the other parts of this series sadly are. So make of that what you will. The soundtrack like the previous collection is still overall well done however, the opening and ending theme have changed and it really was not a change for the better. Perhaps the change in themes was a bad omen or something because their change marks the rapid decline in quality of this series. Both songs aren’t very good in their own right, making poor companions to the series background music and even tone of the show. On the part of voice work, what can I say, the actors in the dub clearly know they are dealing with something that all in all just isn’t very good. But you have to give them points for effort, although it’s evident in their voices that they are growing tiresome of these roles, they still do their best in portraying them. Which is indeed quite admirable, when considering the laughable material they had to work with. The japanese audio is equally well voiced however there is no hint of tire as is noticeable with the English actors. When it comes to the audio portion of the series, I left feeling more sorry for the actors than I did, happy for them for landing a role in this series. Which is a sad thing to say but it is true. Heres hoping they find other better works to let their talent shine. Unlike nearly all Siren Visual releases there is actually special features here. There is clean OP/ED themes as well as 12 bonus short animations called The Secret of St. Lily’s Academy, which is a great improvement over the usual lack of features Siren put out. As for the slip case cove however, that is a disappointment. Siren opted for an incredibly similar slip cover to the previous collection that from a distance would not look any different until closer inspection. Besides that, Siren have done a relatively good job with extras here, especially when compared to their other releases. 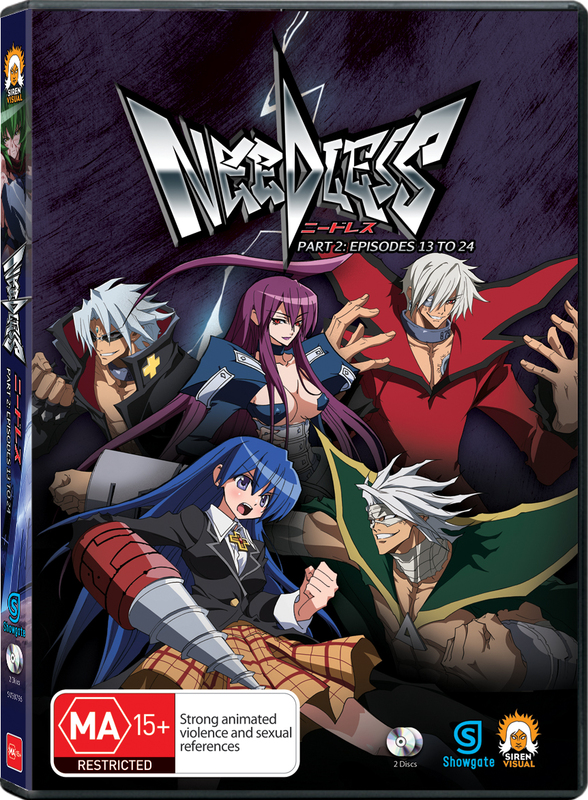 Needless Part 2 is 12 episodes of anime that I would unfortunately rather forget. I do not intend to come across as hitting this series too hard, as I truly did enjoy it at one point. But it slowly unfolded into something so utterly disappointing from all possible perspectives that I am given no choice but to do so. Don’t get me wrong, this series had a lot of potential. 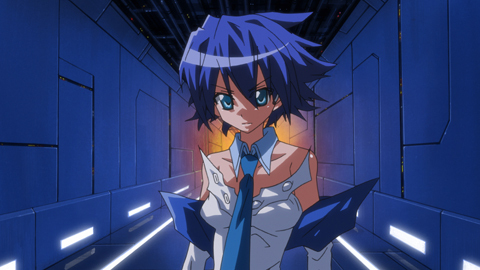 The way it parodied common anime tropes all the while telling a relatively compelling story, had me rather engaged in the early going, however it all amounted to nothing in the end, becoming merely another added to the pile of best forgotten anime series.